The first Falcon 2000-series cockpit nose assembly made in India by Dassault Reliance Aerospace Ltd. (DRAL)—a joint-venture of Mumbai-based Reliance Infrastructure and Dassault Aviation—is now ready to be delivered. 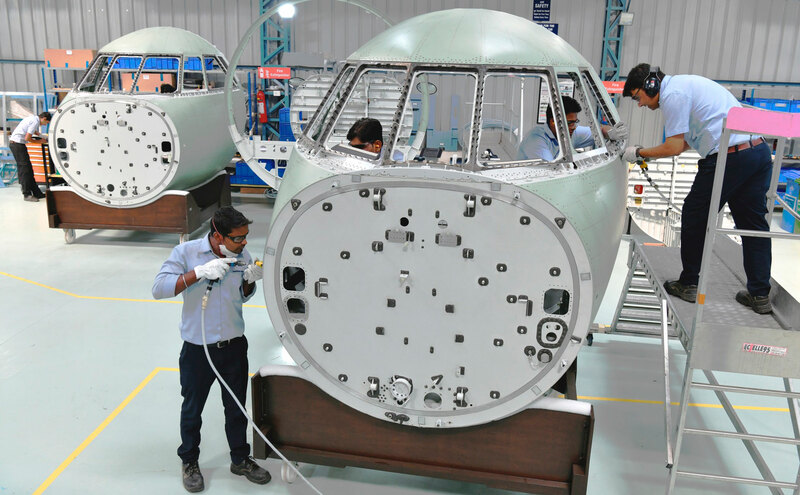 Assembled at DRAL’s facility in Nagpur, the nose section is expected to be ceremonially handed over to Dassault later next week at the Aero India airshow in Bangalore before being shipped to a final assembly line in France. DRAL’s facility is located in the special economic zone adjoining Nagpur International Airport. The foundation stone was laid 15 months ago “to manufacture several components of the offset obligation connected to the purchase of 36 Rafale Fighters from France, signed between the two governments in September 2016,” Dassault said. Presently, DRAL is slowly building up a supply chain in India having already awarded many of the approximately 2,500 components in the Falcon 2000’s cockpit section. The plan to assemble the cockpit in Nagpur was made due to the lower cost of Indian labor. “We remain committed…to making our humble contribution towards the 'Make in India' and 'Skill India' policies of the government in the critical area of defense, including our offset partnership agreement with our valued partner, Dassault Aviation of France,” said Reliance Group chairman Anil D. Ambani. Speaking about the joint venture last year, Dassault Aviation chairman and CEO Eric Trappier told AIN, “Reliance is our partner and we believe in them,” adding that people in India were being trained to ensure skill sets.